She continuously picks up men… connects for a night and then disposes of them quickly. As in now… as in LEAVE. Cecilia Bommarito is depressed. Her husband is having an affair right under her nose. And so she eats… and eats… and eats while her anger boils over onto anyone in the way. Janie Bommarito is a best selling author. While shy and a loner in real life, her books are filled with heinous crimes that would make the strongest persons stomach churn. She lives alone in a boathouse and counts everything out by fours…. The Bommarito sisters all have issues…. BIG ONES. And if you met their mother, River Bommarito (one time stripper, dancer, child neglecter…. ) you may understand why. Did the Bookies have a fire? The Bookies book club read this for their January book pick. It had been nominated before… and passed on. This time, it won the vote. When the sisters Bommarito’s are all called home to help take care of Henry while their mother goes into the hospital for surgery – there is, to say the least, reluctance. The girls do not have fond memories of growing up with a mother who neglected more than loved… who at times layed in bed for weeks under the weight of her own depression leaving the girls to fend for themselves and Henry. And now added to the top was their grandmother who had Alzheimer’s so severely she thought she was Amelia Earhart. As for the Bookies…. what a great review. We had spaghetti and lasagna (two on Henry’s favorite meals). 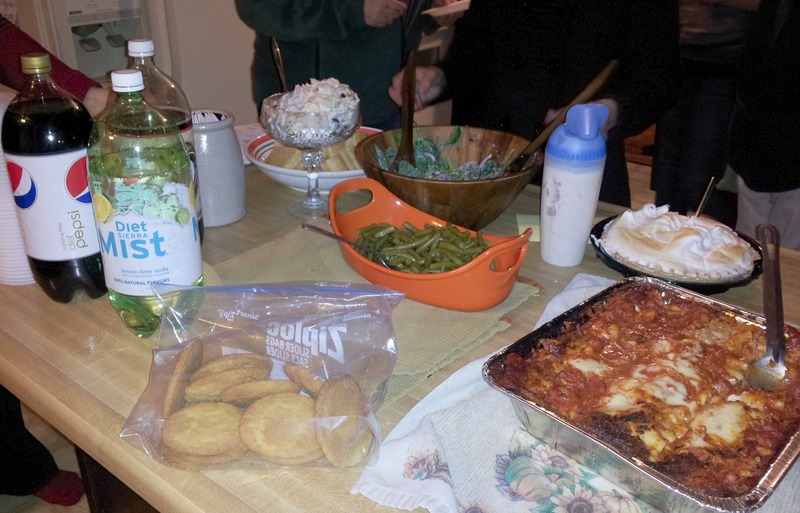 Garlic bread and a chicken salad, and even home made cupcakes – to die for!!!! We loved the book, no one rating less than an average read – more leaving towards the higher marks. We discussed the sisters we felt we were most like, and Henry’s unwavering kindness to all. We could all learn a little something from Henry. In the end, out of the 16 of us in the room, 9 admitted to bawling like a baby at some point in the book… present company included. Henry’s Sisters is a book I personally loved – Cathy Lamb writes with a quick whit and a way that made me feel I was in the room with these quirky characters. I highly recommend this read – it was touching and funny. Morning Meanderings… World Book Night Needs YOU! Sounds like a fantastic book…and a fantastic book club! You have the BEST book club! I love it when you share stories and photos. Those cupcakes were over the top! Y’all sure know how to party. Thanks for sharing, will put it on my TBR list and hope to read it sooooon! And you have a real life book club, enjoy it!! It looks and sounds very cozy! Oh good Cessie – I hope you enjoy it as much as I did! Oh, I’ve been waiting for your review! I knew you would love it, even though I still haven’t read it yet! I will. It’s sounds like my kind of story in every way. And, can I just say, there is something about messy looking desserts that make my mouth water!! I seen you had it on your :to be read” on Goodreads Alison! I didn’t have the cupcake but I heard they were fantastic! I must say that despite this being a book I would not normally think about reading, your enthusiasm for it has me rethinking my priorities. Thanks for the review. I’m definitely adding this one to the list….I’ve read and adored other books by this author, but this one sounds really special. Thanks for the review. This is definitely going on the list. Its also available in the library. Now to go and snag it before anyone else does. Sounds like a good read, thanks for the review! I read this a few years ago. Unfortunately, I’ve forgotten most of it. Including Amelia Earhart! Amelia was hilarious – she reminded me a bit of the grandma in the Stephanie Plum series. I loved this book – wish I had had that meal to go with it though! The cupcakes make me hungry, the bra-burning makes me smile .. your description of this book, complete with the bawling, makes me want to pick it up! Thanks for a great review! Definitely a great Bookie night! Ya should have contacted me…I Skype with book groups all over the country, all the time. Soooo glad that The Bookies enjoyed Henry’s Sisters. Have another one out in August, A Different Kind of Normal. Hopefully it will make you laugh…and cry. PS That dinner looked delicious….someone sure knows how to cook. I will keep an eye for that next book too!